Your wine cellar’s constant temperature and humidity create the perfect environment for a humidor. The approximate 50% relative humidity of the wine cellar helps the humidor maintain the recommended 70% relative humidity for cigars. Humidity fluctuations down to 60% or lower can dry and split cigars; up to 80% or higher can mold and swell cigars. The wine cellar’s cool temperature also prevents the hatching of harmful tobacco insects. This beautiful accessory stores 150 to 200 cigars and features adjustable dividers that allow a customized compartment size. The drawer and housing are hand-crafted of rich, solid walnut and walnut veneer, finished and sealed to prevent moisture escape. 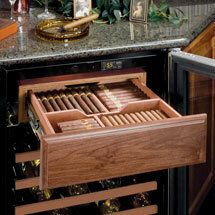 The drawer itself is lined with untreated aromatic Spanish cedar, the preferred wood for humidifying and aging cigars. Drawer contains four adjustable dividers to accommodate cigars from five to eight inches in length. Smooth, snug-fitting Spanish cedar dividers are easy to remove. Drawer rides on steel slides with precision ball bearings for silky action. Built-in closure solidly seals the chamber. Tongue-and-groove construction ensures structural integrity. Humidification system is discreetly hidden, yet easily accessible. Interior dimensions are 15-1/8”D x 14-3/8”W x 3-1/4”H, 25lbs. The Humidrawer™ reduces the capacity for wine bottles by 7 to 14, depending on model. Disclaimer: Marvel Wine Cellar and Beverage Center units are not designed to achieve refrigeration product temperatures under any conditions, and therefore is not sold with the intent of storing fresh foods. Leave it to Marvel to let you combine two luxurious sensory pleasures in one elegant designer model, thanks to the exclusive Humidrawer™ cigar storage compartment. The Humidrawer™ is a self-contained humidor which caters to the demanding requirements of perfect cigar storage. Designed and hand-crafted by H. Gerstner & Sons, master cabinetmakers since 1906, the patented Humidrawer™ helps maintain the optimum temperature and humidity for cigar storage. 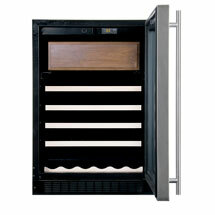 The Humidrawer™ is designed to fit into the following Marvel wine cellars: 61WCM, 66WCM, 66WBM, 66BWM. It is easy to install.